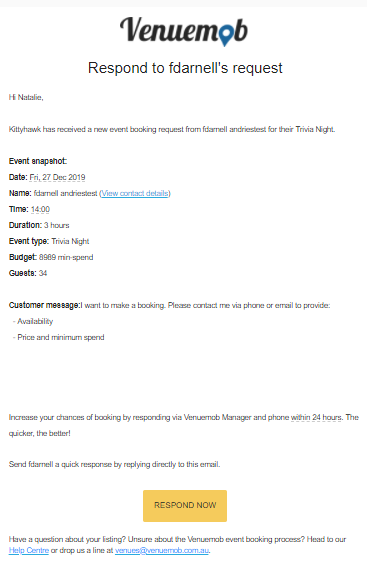 Who receives my venue's event enquiry notifications, and how do I change the recipient? Venuemob enquiries are sent to an assigned contact at your venue. Learn how to assign a key contact, and change the recipient as you need. When a customer sends an event enquiry, a message will be sent straight to the inbox of your venue's assigned enquiry contact/s. You can assign multiple staff members at your venue to receive an email notification of each enquiry, and you can change the recipient of enquiry notifications at any time. You can add or change enquiry contacts – and who receives enquiry notifications – in the 'Staff' section of Venuemob Manager. Head to Settings > Staff then click ‘add’ and input the selected staff member’s name, email and phone number. Click ‘invite’ to notify the new staff member and provide them with login details. Select ‘Email’ or ‘SMS’ to switch enquiry notifications on for individual staff members. Work in whatever way is smoothest for your team. Send all enquiries to a central email then assign them out to each staff member, or send all enquiries to every single person on the team. Add as many members of your team as you'd like, to ensure no event slips through the cracks. Adding each staff member to the dashboard.